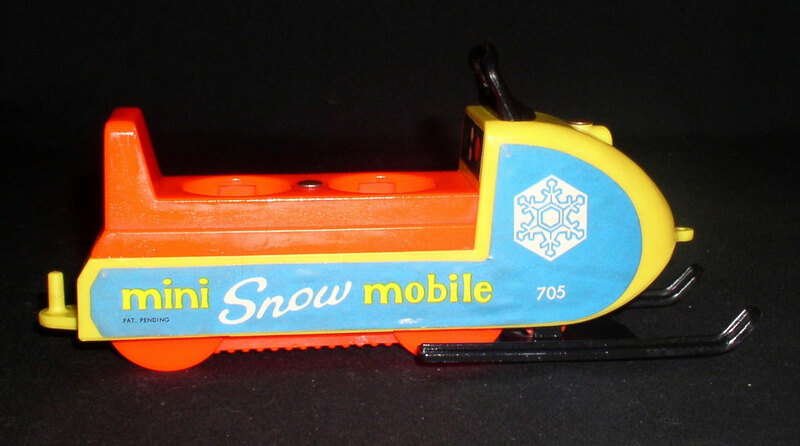 Description: Yellow plastic snowmobile with realistically cleated track and 2 RED skis on the bottom. The snowmobile has a BLACK seat that seats 2 Little People figures. The top of the snowmobile has a RED windshield. The back of the snowmobile has a small yellow peg hitch that sticks straight up. 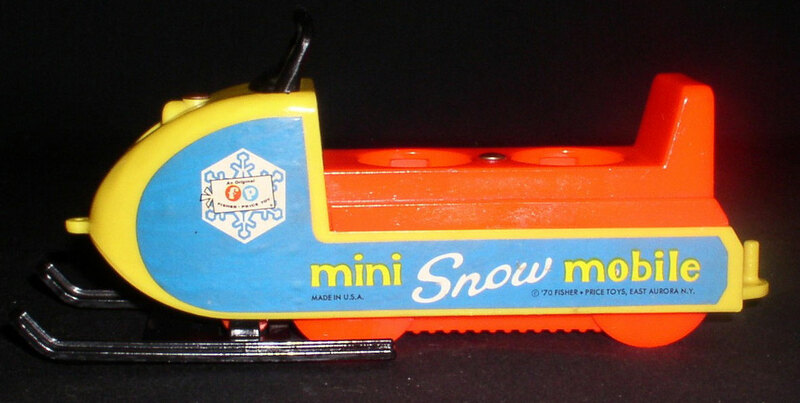 Each side of the snowmobile has a paper litho attached (usually ripped, turn, or completely gone) that has a turquoise background, a white snowflake at the front, and the words "mini Snow mobile" in yellow and white. The dashboard has a black rectangular litho with a green dot, red dot, and 2 white dots in the center. Size: 6-3/8" long x 2-1/2" wide x 3-1/4" tall. Description: Yellow plastic snowmobile with realistically cleated track and 2 BLACK skis on the bottom. The snowmobile has a RED seat that seats 2 Little People figures. The top of the snowmobile has a BLACK windshield. The back of the snowmobile has a small yellow peg hitch that sticks straight up. 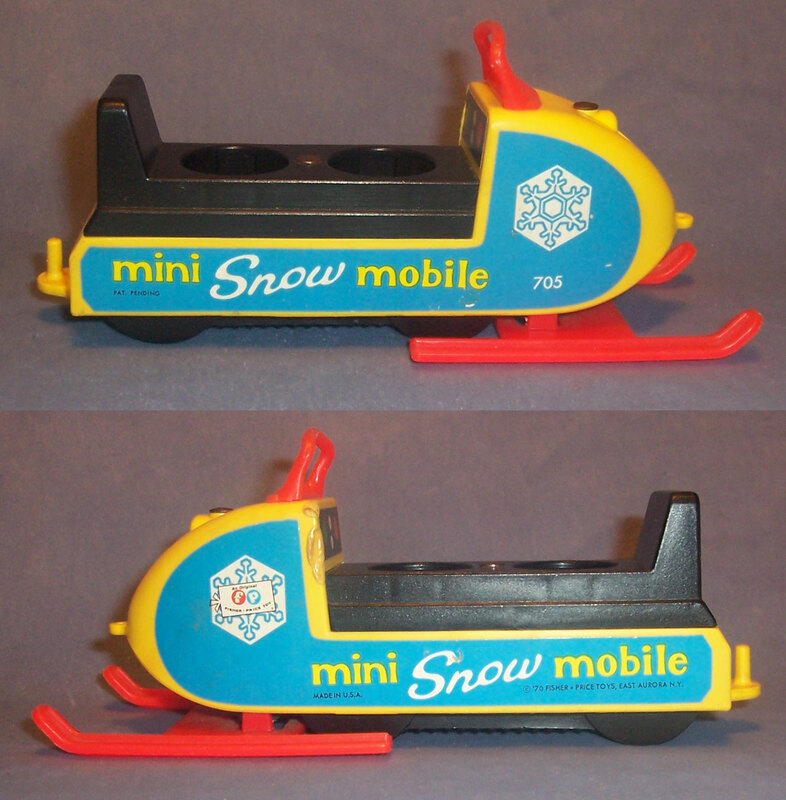 Each side of the snowmobile has a paper litho attached (usually ripped, turn, or completely gone) that has a turquoise background, a white snowflake at the front, and the words "mini Snow mobile" in yellow and white. 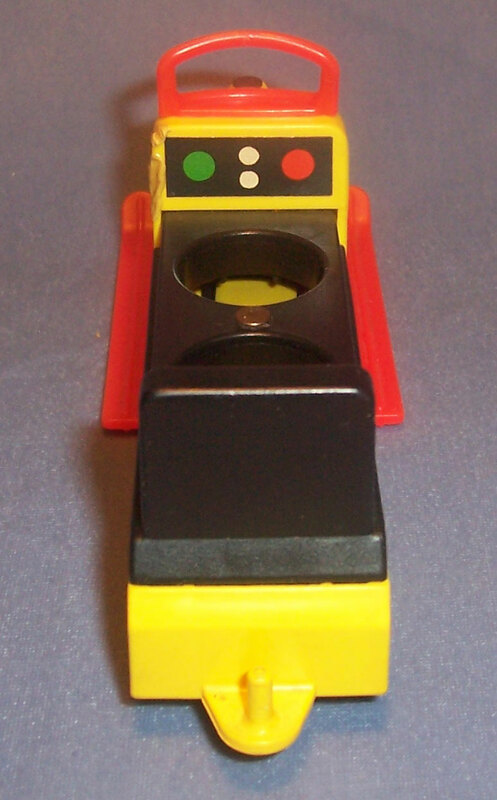 The dashboard has a black rectangular litho with a green dot, red dot, and 2 white dots in the center. 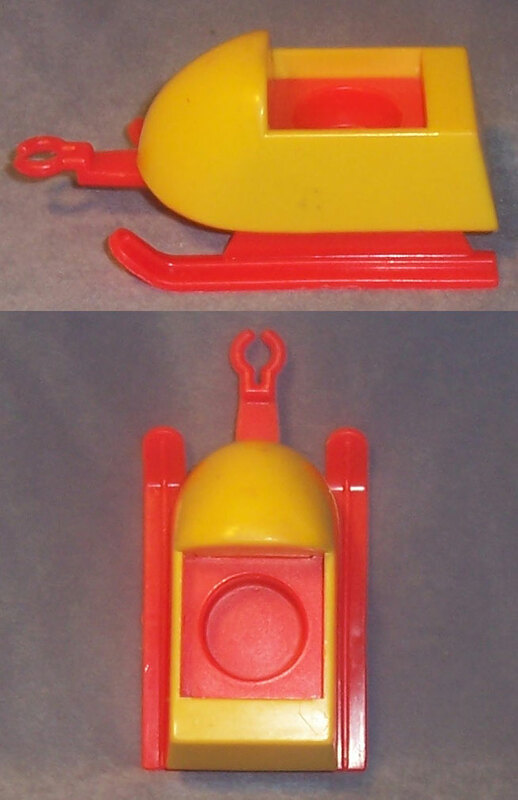 Description: Yellow plastic snow sled with 2 RED skis on the bottom. It has a red seat in the center (seats 1) and a red hitch on the front that connects to the peg on the back of the snowmobile. The ski color should match the snowmobile's skis. Size: 3-7/8" long x 2" wide x 1-5/8" tall. 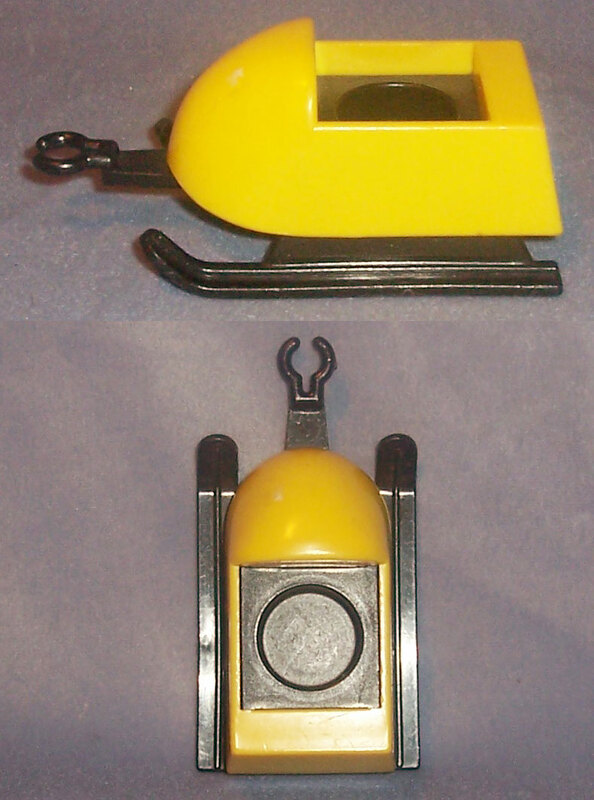 Description: Yellow plastic snow sled with 2 BLACK skis on the bottom. It has a red seat in the center (seats 1) and a red hitch on the front that connects to the peg on the back of the snowmobile. The ski color should match the snowmobile's skis.